Follow this installation guide in order to setup your workstation for development using Mobile Foundation. 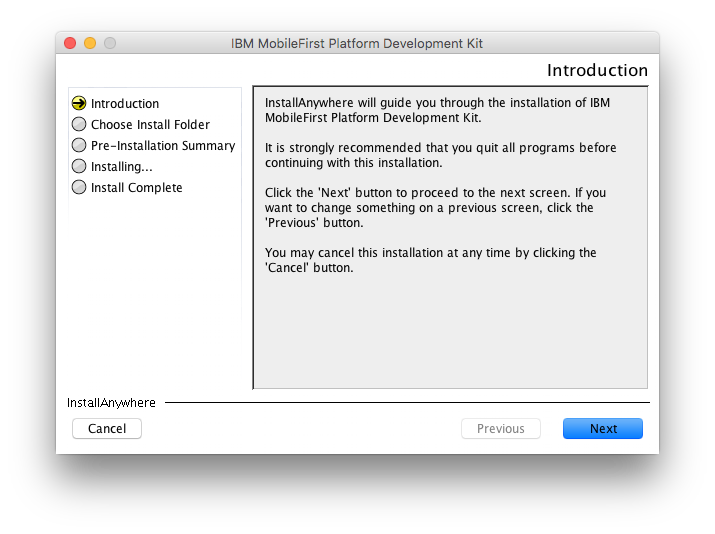 The MobileFirst Developer Kit Installer will install a ready-to-use MobileFirst Server, database and runtime on your developer machine. The installer requires Java installed. Get the DevKit Installer from the Downloads page, and follow the on-screen instructions. Open a command-line window and navigate to the extracted folder location. 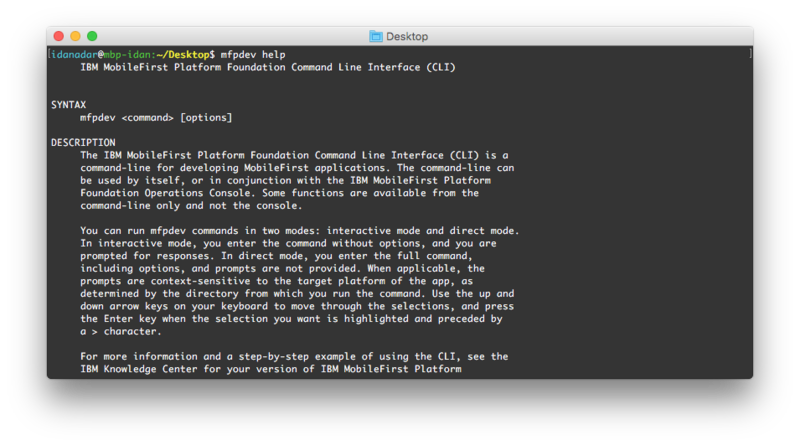 NodeJS and NPM are requirements before you can install the MobileFirst CLI. Download and install NodeJS v6.11.1 and NPM v3.10.10. For MobileFirst CLI version 8.0.2018100112 or higher, you can use Node v8.x or v10.x. To Verify the installation, open a command-line window and execute: node -v.
Some CLI commands, such as creating, building and deploying adapters require Maven. See the next section for installation instructions. Open Terminal and execute: npm install -g mfpdev-cli. Mac and Linux: Note that you may need to run the command using sudo. Read more about fixing NPM permissions. To Verify the installation, open a command-line window and execute: mfpdev -v or mfpdev help. Adapters and Security Checks are your door-way to introduce authentication and other security layers to your application. Apache Maven is a required to set-up before you can create adapters and security checks. Follow this guide. Verify the installation by executing: mvn -v.
With Apache Maven installed, you can now create adapters either via Maven command-line commands, or by using the MobileFirst CLI. For more information, review the Adapters tutorials.